We started the year with a busy note. From days with all freed up weekends, we have filled our weekends with classes. The daughter has gotten intensive into her gym training and the boy has started badminton. All filled on Saturdays and Sundays. Though they very much enjoy what they are doing, I'm a tad depressed that precious weekends are sucked into classes. And most times, we have to adjust our schedule to the coaches' schedule. Much more than the other way round. For being a home Mum, I've always tried every best to fill classes on weekdays, just so weekends are solely for free time. Jare has drums on weekday and badminton on weekend. This boy needed a sport to keep him sane. Jazz's plate is fuller, she has gym training four times a week, twice in school and twice over the weekends. In midst of weekdays, she has piano and violin. This really isn't our ideal, but probably the best hours we can put in for her upcoming competition. In competitive sports, her training hours are shy of what most athletes are pumping in. Her weekly schedule is pretty much filled. I've asked ourselves umpteen times if there is something we should rejig or let go, but we couldn't decide. We did consider putting music on hold, but I didn't want to risk her losing interest in them. Not that she is excelling, but because starting them off wasn't a hasty decision, they were meant for long term. Starting two musical instruments was never my plan. With her already doing piano then, she asked to do the violin. Music is a long and dedicated journey. Once started, giving up is not an option even when journey is tough, giving up is not an option even when your teacher got a little more strict and giving up is not an option since the day you embarked. We have not ended our race, perseverance is probably the only option. Most times, a kid gave up on something, not because he chose to, but because the parents chose to or partnered that decision in a way or another. At this point of her schedule, I am concerned about her childhood. I am concerned about the increased work load from school and the delayed bedtime she gets. I am intensely concerned about protecting her free time for play. Even if it means crafting time for boredom. Just last week, the daughter heard a conversation between her piano teacher and me. Her teacher was unable to make it for the next lesson, and asked to do a make up the following Monday which Jazz has gym on. I do not really like doing make up lessons out of our allocated time schedule, but I understand private teachers teach for a living and if every parent calls off lesson as and when, what is stability to their income? With that thought, I took the liberty to okay for a makeup lesson on Monday, which Jazz has gym. No other schedules could meet the teacher and ours. So make up lesson will be on Monday, after gym and dinner. Jazz came up to me after the teacher left, and said in a pathetic tone, "After gym is very tiring you know. I don't run on battery, Mama." That was my wake up call! I mean even if it is just a one time schedule of packing 2 lessons in a day. I really thought she could grit on and just do a lesson of piano. I must have overlooked her physical and mental ability. It's sad that kids today run packed schedules. Those days when our weekends were all so freed up, we couldn't fit a good play date because most of their friends would be engaged with lessons. These are kids of our century. The trend of declining playtime. And the daughter is absolutely right, she doesn't run on battery. I had better sort it out quick before she gets flat out. I told her teacher, we are unable to do any make up lesson, and we will skip lesson for a week. That's just how "consistent" we get with music practice. But mental state is always a priority. We will take it slow and hopefully, move as steadily as we hope to. Jazz spoke right into me, while most of the times I give them choices about their schedule and what they had like to do about their activities and lessons. I must have overestimated her ability. Even if she was a battery, everlasting is a matter of time. How quick should we intervene or what right choices should we make right at the beginning? I'm very sure at this point of time, we will need to free up her weekend gym schedule once competition is over next month. If she is agreeable. 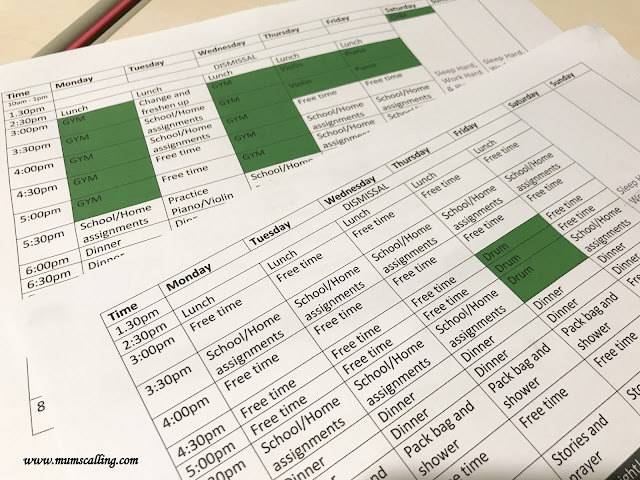 What is your child's schedule like? Let's be reminded that there are greater things and achievements than running in and out for classes. There are different environment and places to hang around in. Let's be reminded to factor in free time for their hobbies. Time is often more on hand when they are a child, more than when they step into the corporate world. Their kind of childhood is very much in our command. There is really much considerations when starting our child on something. Do we want it short-term or long-term, what approach are we taking towards it, does a school or private teacher give us the flexibility we want and of course, if our child is enjoying their schedule? Let's not get sucked into the system of 'because everyone is doing it', but because my child needs and enjoys it. Enrichment, be it arts, music, sports or academic, in any childhood today, it's almost inevitable. Do we want to orchestrate their schedule or do we allow them to play the music of their life? I forgot to ask my kids, but I will ask them tonight, what are the activities that bring them most joy?! We should be doing more of that! This Lunar New Year, we want to celebrate family bond and rest from schedules. May you have a splendid time ahead too, Happy New Year! The Lion King musical returns!